Berry Center AV operator Alesia Hendley puts the news in context for AV professionals in the AV/IT Weekly Update video series. This week, learn about the latest news from Attero Tech, DPA Microphones, Extron, and VidOvation. 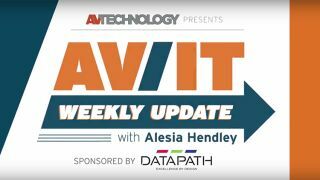 The AV/IT Weekly Update is sponsored by Datapath. Learn more about Datapath's award-winning video wall controllers, video capture cards, graphics cards, streaming, collaboration, and compression solutions at https://www.datapath.co.uk/.